Our range of DEEP FREEZE cryogenic barcoded ID labels are ideally suited for sample identification that withstands liquid nitrogen, anything from a quick flash exposure to long term storage. Labels are able to withstand harsh environments. Provide high quality easily legible information with barcodes in almost all applications in laboratory. Deep freeze cryogenic labels suitable specifically for small diameter cryotubes & cryovials, cardboard freezer boxes, polypropylene cryo/freezer boxes, cell culture plates, plastic bags and other containers for storage in liquid and vapor phase liquid nitrogen (-196ºC), liquid helium (-269ºC) and laboratory freezers (-120ºC, -80ºC, -20ºC). 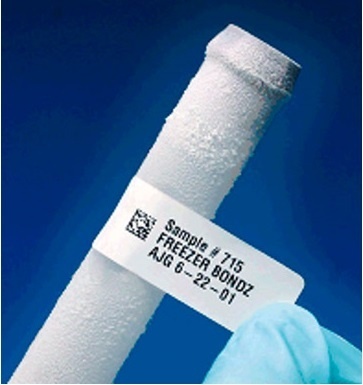 Deep freeze cryogenic labels are made from strong thermoplastic film coated with an extra-permanent cryo adhesive, can be immersed in liquid nitrogen immediately after applying to item, and do not require the use of additional tape or wrap-around. Waterproof, weatherproof and durable, eep freeze cryogenic labels adhere to wet and moist surfaces, and withstand a range of extreme temperatures including multiple freeze-thaw cycles, transportation on dry-ice, and sterilization by Gamma irradiations (tested up to 50 KGy). Grease-proof, they can also be used for outdoor applications such as labeling plants, flowers, gas and oil production equipment, and more. Resistant to spraying with ethanol, isopropanol and other alcohols, bleach, DMSO, detergents and other chemicals (testing recommended). Label printouts are also resistant to alcohol and mild solvents when printed with our top class superior RESIN Themal transfer ribbons for barcode printers such as Zebra, Honeywell Datamax, Sato, CAB, Intermec, CognitiveTPG, Printronix printers. FDA Compliance: FDA 21 CFR 175.105 for indirect food contact as well as RoHS compliant.